1) Preheat oven to 150 deg C. Line a 18 cm square x 7 cm height baking pan with parchment paper. 2) Sift flour and cocoa powder together. Add egg yolks, sugar, oil, milk, salt and vanilla essence into the flour and mix well till smooth with a hand whisk. 3) In a separate big mixing bowl, whisk egg white with 1/4 tsp cream of tartar and sugar with an electric mixer until firm peak form (not dry). 4) Gently fold 1/3 of the meringue into the yolk batter, mix well. Then pour mixture back into (3) mix well with a rubber spatula. 5) Pour batter into cake pan, Tap the pan on a surface for a few times to get rid of big bubbles. Sprinkle chocolate chips on top. 6) Steam bake the cake on the lower rack in a preheated oven for 65 - 75 minutes or until a cake tester inserted in cake comes out clean. 7) Tap the pan on the surface for 2 to 3 times while hot, remove cake from the pan, leave it cool on the rack completely. 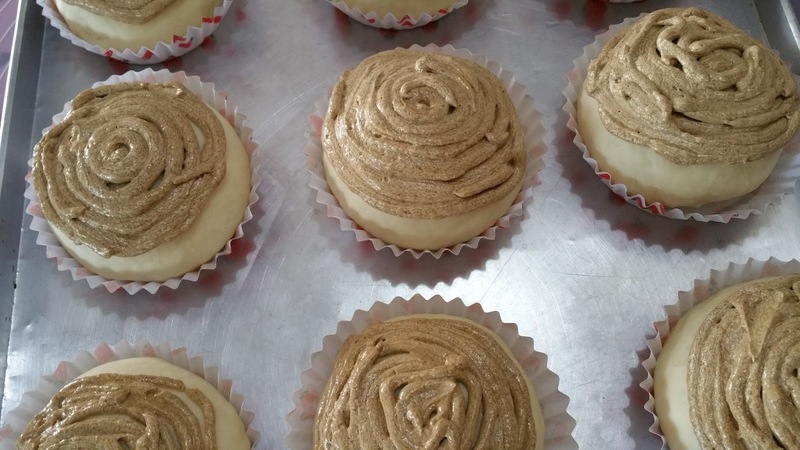 If you are of Hakka descent, or one of your parents is, you may have seen this kuih before. The Chinese name for this plant is called AiCao or Aicai 艾草或艾菜). 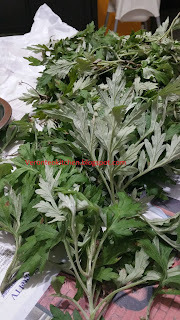 Its English name is Mugwort or Wormwood. Here I will not talk much about the benefits; you can google for more information. 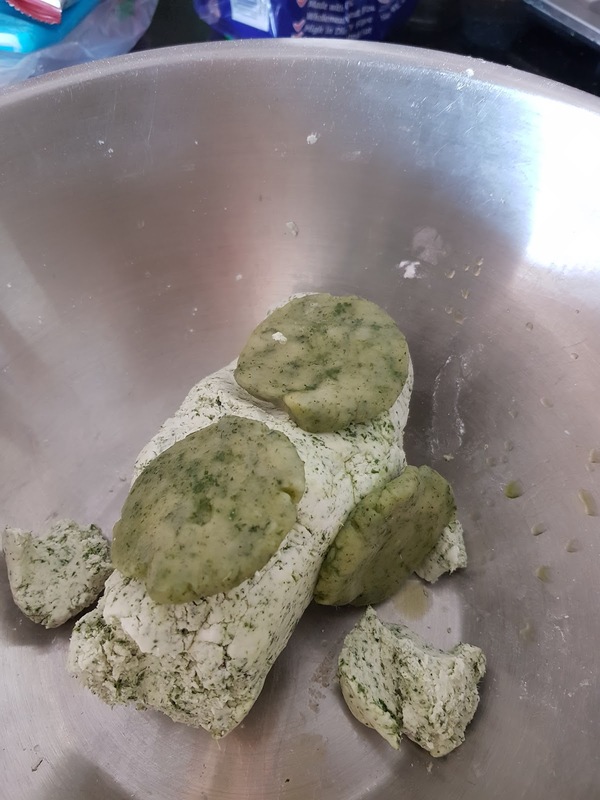 Its slightly bitter in taste and has very strong herb aroma. 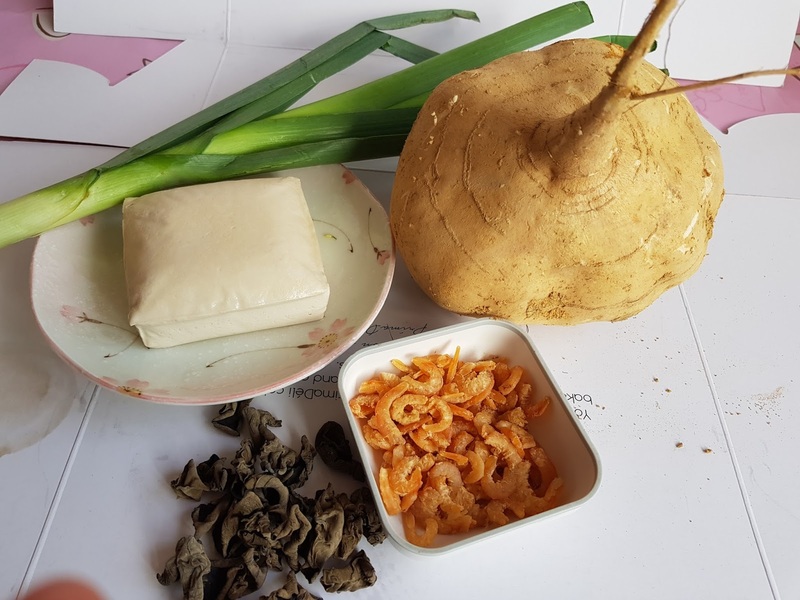 Due to its unique taste, it is usually not very commonly accepted by people, especially the younger generation. I hardly see people selling this kuih in the shop or market, let even the fresh aicao. Today I got the courage to make this because I wish to record this dish for my children. Come the day in the future when I am gone, if not for this blog post, nobody will remember what is "aicao ban"（艾草粄). 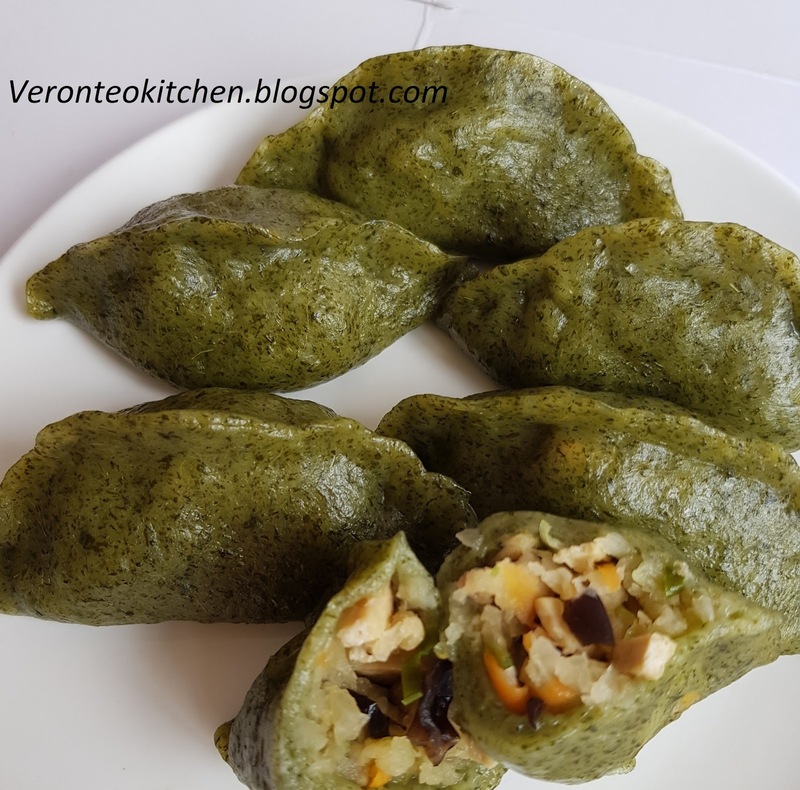 Note: 'ban' (粄) means kuih (dumpling) in Hakka. 2) Heat 2 tablespoon of oil in a wok, saute dried shrimps for few minutes, then add shallots, garlic stir fry till fragrant. Add in minced pork, cook till the meat is cooked. Then add turnip, fungus and seasoning cook for a while. 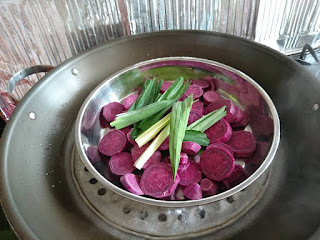 Add in seasoning (adapt and adjust to your taste bud) and leek, fry well. Dish up and leave to cool for later use. 1) Pick only the young mugwort leaves , discard the old leaves and stems to get 50 g。Wash. 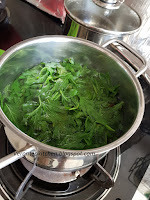 2) Bring to boil with water just enough to cover. Boil for about 10 to 15 minutes. Use a food processor to blend, drained and get the residue. Do not throw away the water. 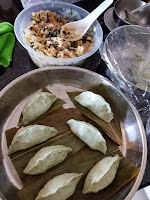 3) Combine glutinous rice flour, rice flour, sugar and the mugwort residue and water to mix well till a pliable dough is formed. I forgot to weigh the water but do not worry. Gradually add water while you are mixing the dough till you get a pliable dough (not too wet). 4) Weigh the dough and take 10 % of the dough. 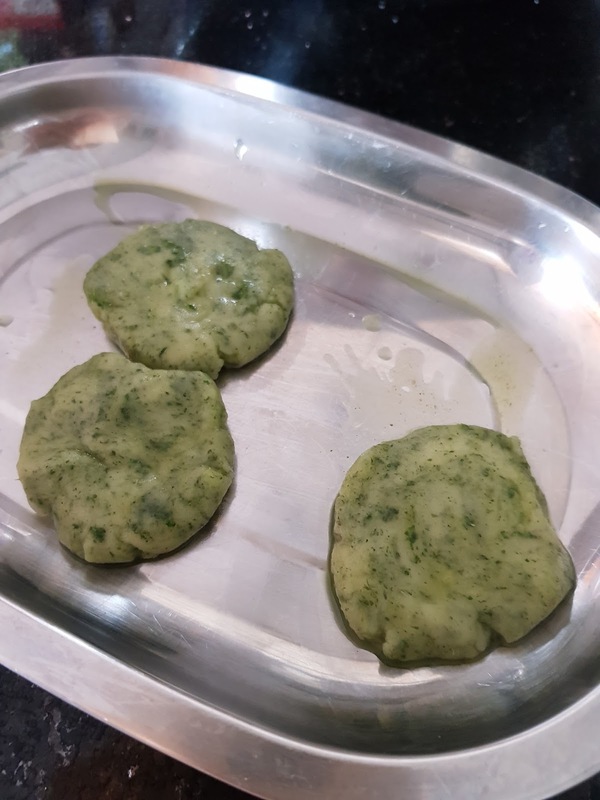 Take the 10% small dough divide into 2 or 3 portions.Roll round and flatten, boil the dough in the water (boiled mugwort water from step 2), till it floats on the surface - this is your cooked dough. Take out and tear into pieces, add into the dough and knead till a smooth dough. Do not forget to add oil now and knead further for few minutes till you get a smooth and pliable dough. Cover and rest for 10 minutes. 5) Scale dough into 25 g each. 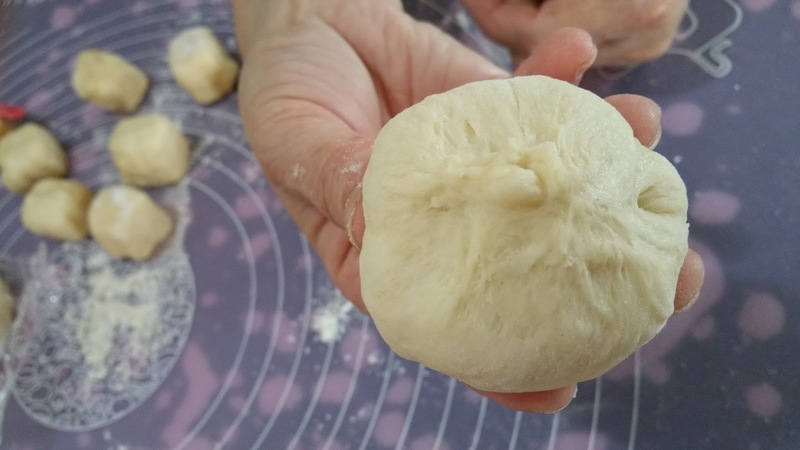 Roll into balls and use your palm or a rolling pin to flatten the dough like a round disc. Put a tablespoon of filling at the center, close the opening and seal properly. 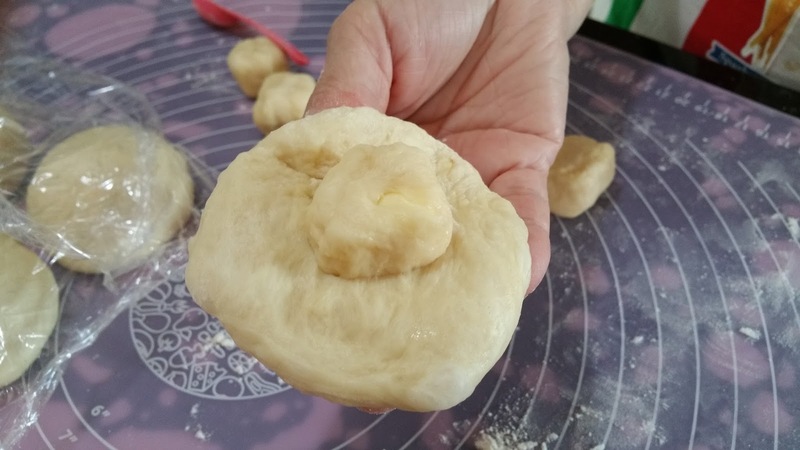 You may make into a dumpling shape (饺子jiaozi). 6) Place them on a greased tray (if you do not have banana leaf), steam over high heat for 15 minutes. Note: If the dough is too wet add more flour. Ingredients for the filling, minced meat is not shown in the picture. Bean curd is optional. 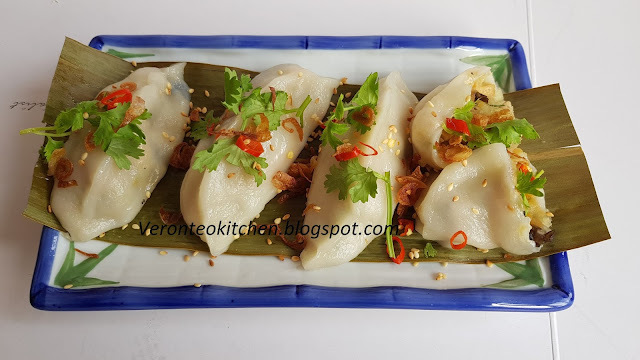 Made plain skin Hakka dumpling with the balance filling. 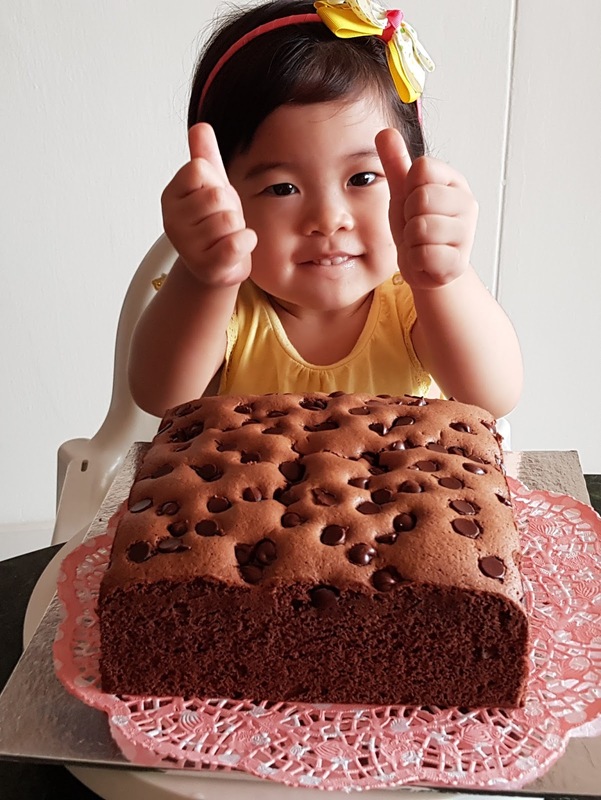 Dear readers, I have been very busy taking care of my grand-daughter, so please pardon my lack of updates! But thank you for coming back to check on me. I am very fine. 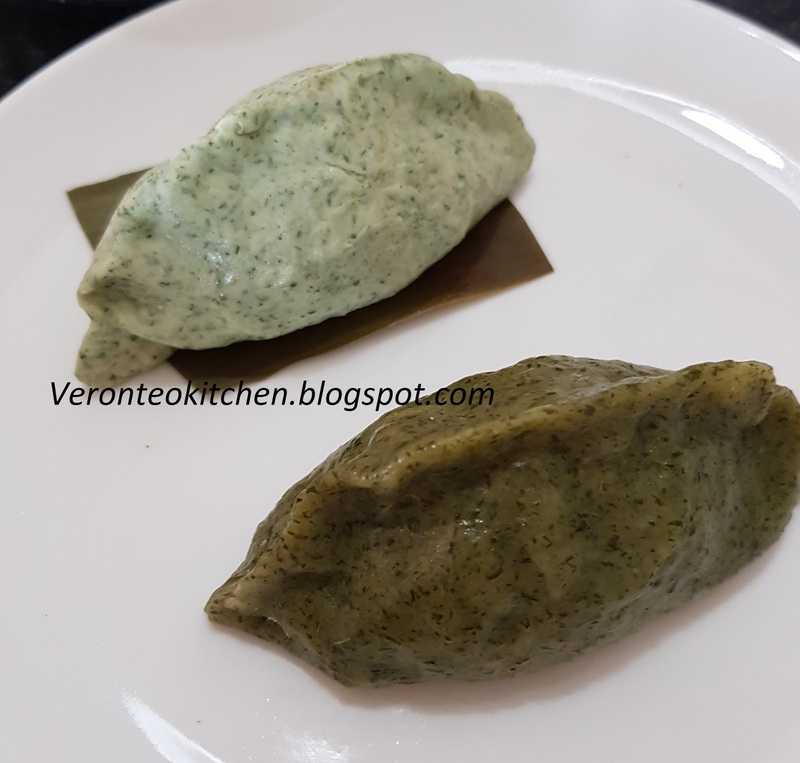 In fact, during this period, I have been cooking daily and experimenting with new dishes. Today I finally found the time and mood to take photos of what I prepared. 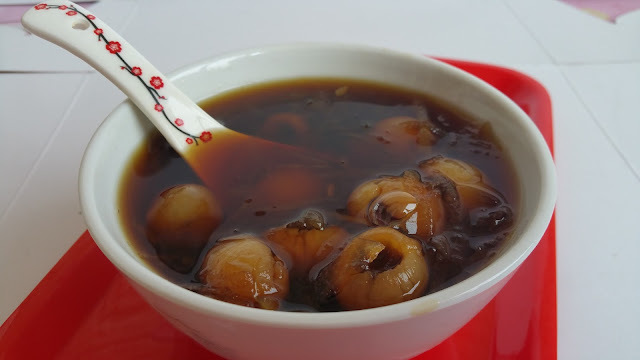 This is Luo Han Guo with Winter Melon sweet soup. Luo Han Guo, otherwise known as Momordica Grosvenon Fruit, can be found at most Chinese traditional medicine shop / supermarkets. Its benefits include relieving cough and reducing phlegm by moistening the lungs. 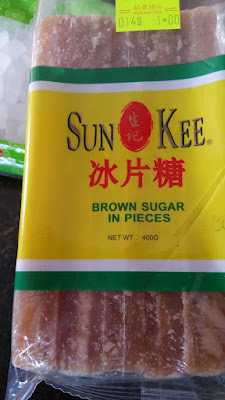 1) Put all the ingredients, except sugar, in a big pot and bring to a boil over high heat. Turn to low heat, cover, continue to cook for 40 minutes or so. 2) Add in sugar and continue to cook for further 20 minutes. 3) Serve hot or cold. Do note that if you follow the recipe as above, the dessert will turn out sweet. Feel free to add or reduce ingredients / water to suit your liking. This is a really long overdue post. I was just too busy to upload this post.. Today I finally forced myself to have it done before the end of 2016. Thanks to the school holidays, my daughter helped to take videos of some of the preparation process. 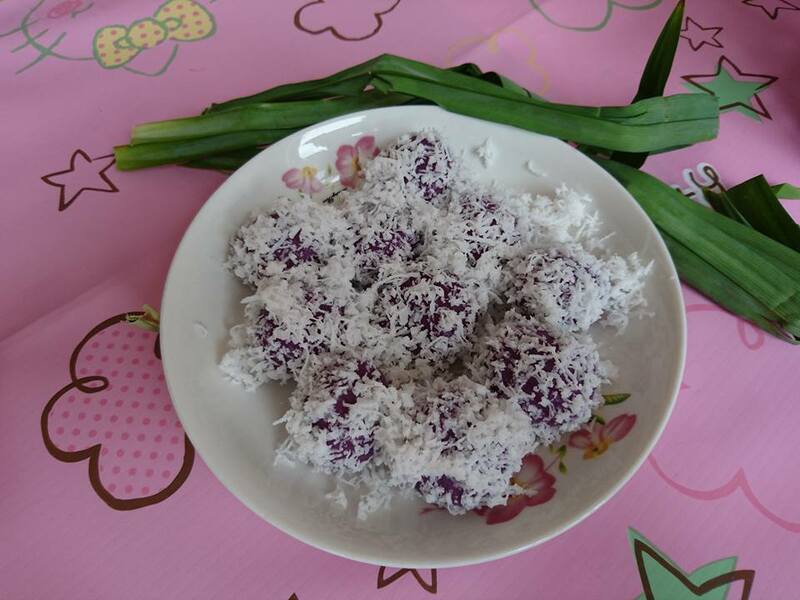 1/2 white grated coconut (I bought S$1 from market and is more than enough for this recipe). 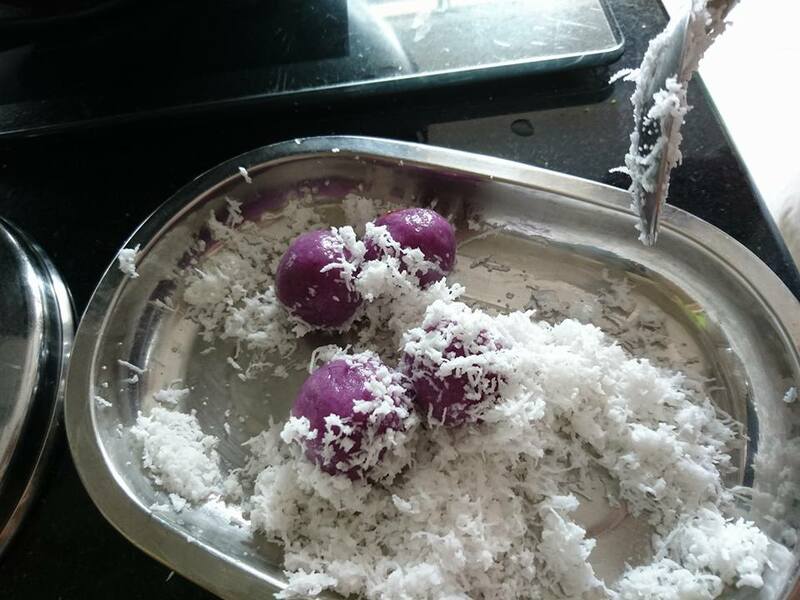 1) Steam the white grated coconut with salt for 5 - 7 minutes (toss before you steam). 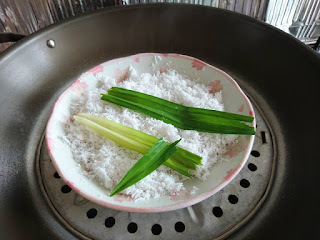 I find that by steaming it together with pandan leaves, the coconut comes out more fragrant. 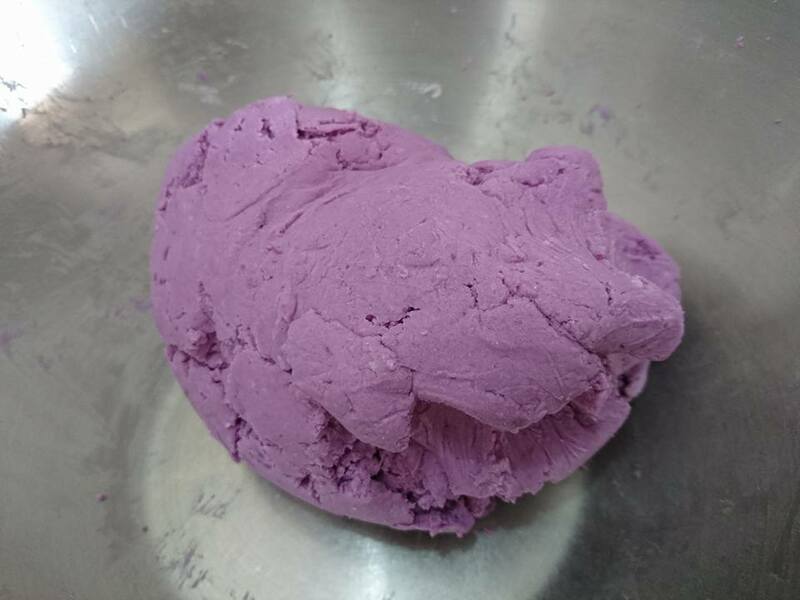 2) In a large mixing bowl, place glutinous rice flour and purple sweet potato. Knead well till it forms smooth pliable dough. 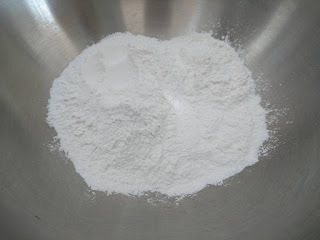 (If the dough is too dry, add a little water; or if it is too wet, add a little flour). 3) Pinch a small amount of dough (about the size of a calamansi lime) and roll it in your palm to form a smooth ball. 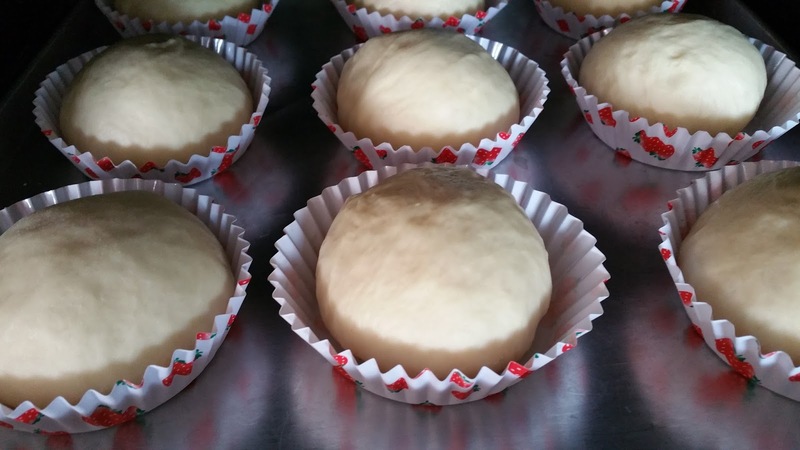 Make a small well in the centre of the dough and fill it with chopped palm sugar. Pinch dough to seal, roll into ball again. I strongly suggest to make only 5 or 6 balls at a time and boil them (refer to step 4) as soon as possible because if you leave the balls stand too long, the dough will crack and the gula melaka will start to leak. 4) In a pot of boiling water, drop the balls in and and when the balls float, remove them with a slotted spoon and allow the excess water to drip off. 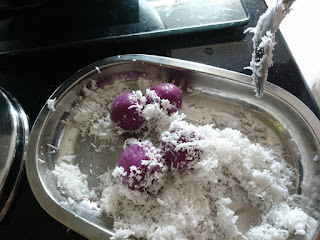 5) Drop the balls onto the grated coconut and gently coat them evenly, then transfer to a plate . Serve along with a cup of hot tea or coffee. Enjoy. The buns from Roti boy or Paparoti used to be my favourite. Does anyone remember when the chains in Singapore closed? Are there any outlets remaining? I do know that they are still available in Johore Bahru and other states in Malaysia. I went to search for similar recipes on Google. 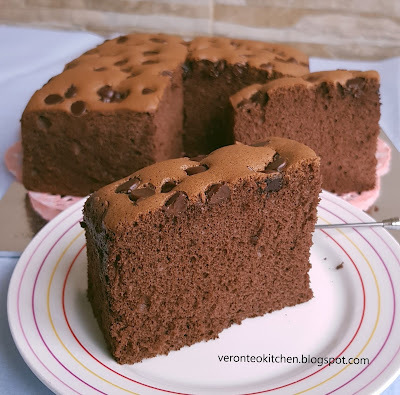 I finally selected a recipe from Bake Cook and Create. I like that the bread texture is soft and fluffy and the topping is fragrant. However, I made very minor changes from the original recipe. My family gave the buns thumbs up. 1) Place all the dry ingredients into a mixing bowl. 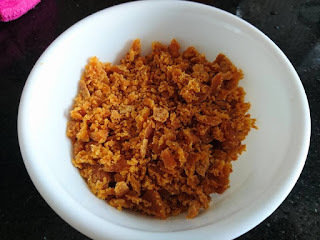 With the dough hook attachment, whisk slowly to mix the ingredients together, add in egg and water (remember to reserve 30 ml), continue to mix and beat all the ingredients to form a rough ball (at this stage if the dough is dry, add water to beat). Then add in softened butter, continue to beat dough till smooth and elastic. 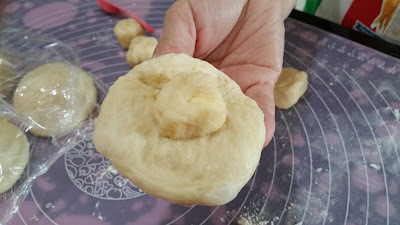 Put the dough into a lightly greased bowl, cover with plastic wrap and place at a warm place and let it rest till it doubles in size (about 50-60 minutes). 2) When the dough has doubled in size, punch down dough to release gas. Divide dough into 10 equal portions. 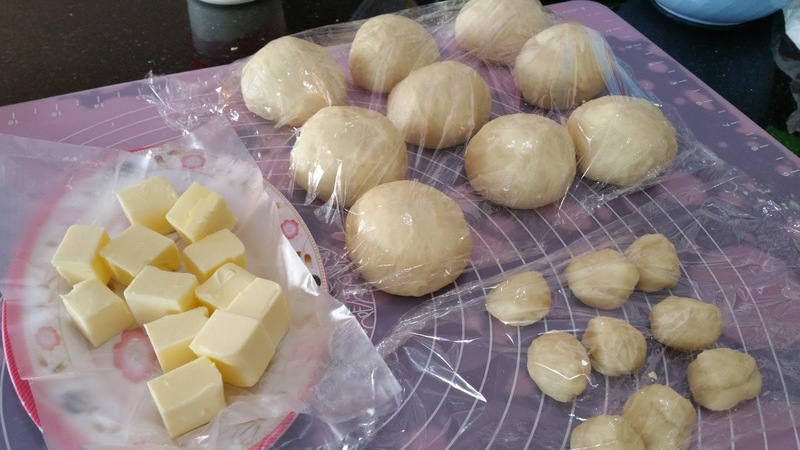 Roll them into balls, Take one of the dough divide into 9 even small balls. Cover with plastic wrap and rest for 5 - 10 minutes. 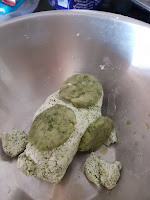 3) Lightly flatten the small ball of dough and wrap the frozen cubed butter. Then flatten the big dough. 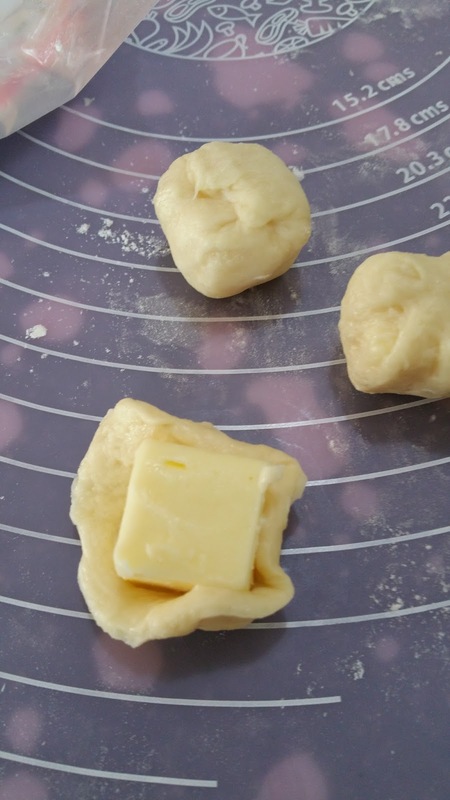 Place the wrapped butter on the main dough. Pleat and seal the edges and roll into balls. Cover with plastic wrap and to rest in a warm place to proof to about 1,1/2 times in size (about 50-60 minutes. 4) Pipe topping on buns in spiral motion. Bake in a preheated oven at 180 deg C for 15 minutes or till golden brown. 1) Dissolve instant coffee powder with 2 tbsp warm water. 2) Beat butter for a minute or so, add in sugar continue to beat till pale and creamy, then add in egg one at a time. Pour in the coffee mixture, beat for a while. Then add in the flour in 2 batches. Beat the mixture till smooth and lumps free. 3) Fill piping bag with topping and set in the fridge for later use. This recipe has been with me since 2001. Only till today I have the chance to cook it. 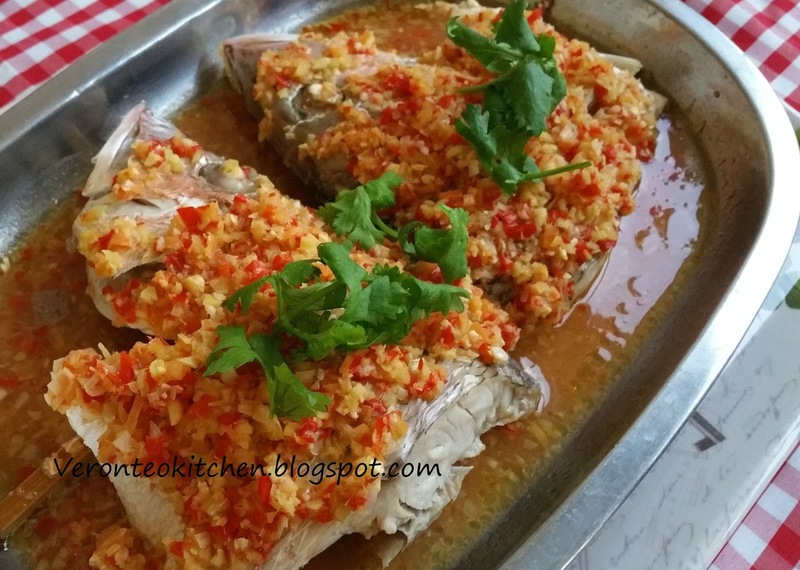 Quite similar in taste to Thai steamed fish in that it is spicy and sour, however the colours vary. 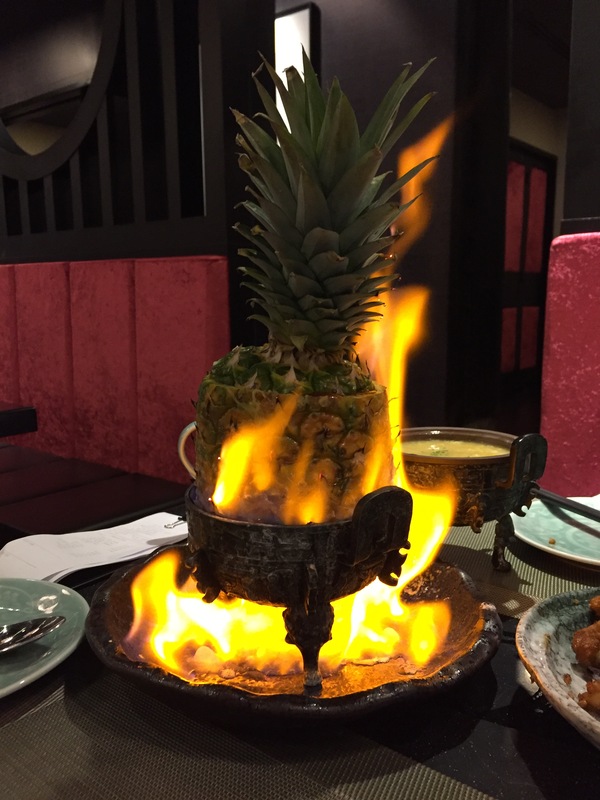 The primary flavour of this dish comes from the distinctive fragrance of wild ginger bud . Plus tangy lime juice and finely chopped chilli - soon you will find you'll need another bowl of rice. Side tip - finding it tedious to finely chop chilli, garlic or ginger? Recently I found an excellent lifesaver. I bought this mini cutter for just $5.90 at Isetan. 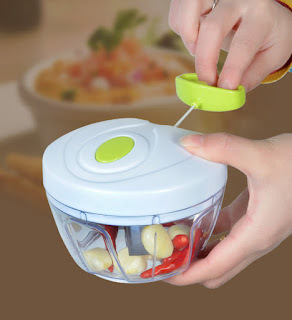 When I usually needed 5 mins or so to chop up all the ingredients with a knife, the mini cutter does the same job in 15 seconds. It's really useful and easy to take apart and wash under running water! Spring onions and coriander leaves for garnishing. 1) Combine ingredients (B) and (C) mix well. Place fish on a steaming plate, pour the mixture on top. 2) Steam over high heat for about 15 minutes and till done. Sprinkle spring onions and coriander leaves on top. Serve. This sauce is very versatile. It can be used to cook any other seafood or meat dishes. The photo above appears to be of wanton soup, but actually the yellow ingredients are not wanton skin! This dish is my own unique creation. Mee Hoon Kueh (面粉粿) has always been my family's favourite. Being of Cantonese descent, they love soup very much and always finish down to the last drop! The soup stock was my usual and today, I was feeling adventurous and added pumpkin puree into the dough for the kueh. 200 g tap water (if it is too dry add a little more water or if it is too wet add a little more of flour). Knead the above ingredient into a smooth and an elastic dough. Divide them into a few small dough pieces. Put in a container or plastic bag and put them in the fridge for later use. 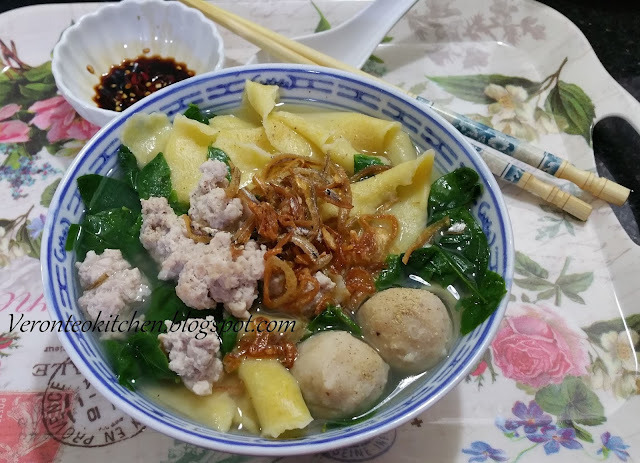 (C) Prepare ingredients such as minced meat, fish ball, prawns, meat balls, fried ikan bilis, and others to your liking. 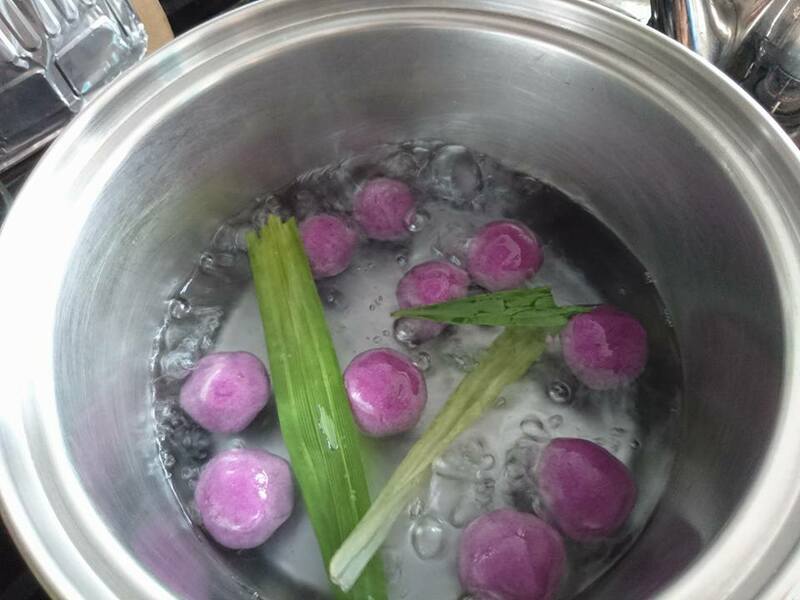 1) Boil the above stock ingredients for 1/2 hour or more. Add salt to taste. 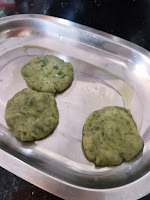 2) Using your fingers, gently pull a corner of the dough into a thin, bite-sized piece. Peel off and place into the boiling stock. 3) Continue to peel and add pieces. Once in a while, lightly stir. 4) While the dough is 3/4 cooked, add in ingredients from (C). 5) Dish out when meat is cooked/soup has boiled. I am a happy housewife who loves to cook and bake. I cook mostly to feed my 3 grown-up monster children. I created this blog to record all my cookings and baking adventures and also to share my tested recipes with you. The most important thing is that I want to pass down the recipes to my children as a form of memento so that they know these are the recipes from the their mother and can then pass down to future generations. ENJOY! Too Much? Search My Blog Here!